Wan Er wrote: James pointed out this project to me, so here I am! Any help is greatly appreciated! Welcome to the project! Wan Er wrote: It's a good idea to have a compilation of all available media that features 3 kingdoms background and characters. Would you also consider including songs and poetry? In fact, if I get time, I might try to contribute a review and commentary for Resurrection of the Dragon. We have already considered reviews. If you would like to contribute a review, then by all means do so. I think James and Butters were all for giving reviews (Its been awhile, and I forget things) so write one and we'll see how it works. I've added the first manga entry - The Ravages of Time. I've actually found an "official" synopsis, at least one that was used in multiple websites. Also, James, or anyone in the know, how does one make a thumbnail of an image? It might help the project have a little more life if I can give it some photos! One more thing, for the pictures, should I just grab screenshots from random websites or should try to find "official" ones as well? Mikhail wrote: Also, James, or anyone in the know, how does one make a thumbnail of an image? Screenshots official or otherwise are fair game. Just aim for consistency. Thumbnails could be a little tricky. I suppose you could use Photobucket (make sure it isn't compressing pictures any more than they already have been -- or upload relevant original picture files as attachments [perhaps in a zip file] so they are available in top form for the page when it goes online). James wrote: Screenshots official or otherwise are fair game. Just aim for consistency. Ok, I got a thumbnail to work with photobucket for the Manga section. Opinions? Also, when you say consistency, can you elaborate? Go with whatever idea works best. Ultimately the media will be on KMA's server. By consistency I mean screenshots should be of relative quality. 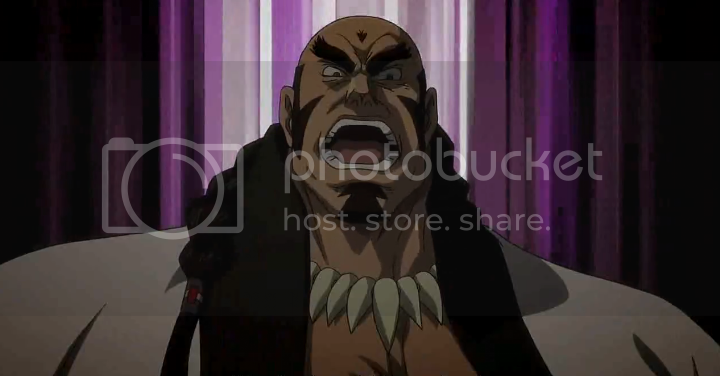 If we have some great 800x600 screenshots from a movie there's no sense in introducing some 300x240 low-quality screenshots found elsewhere. James wrote: Go with whatever idea works best. Ultimately the media will be on KMA's server. Ok! Awesome, thanks for the answer. Follow-up. Does the screenshots have to be of uniform shape? For example, do they have to be a horizontal/vertical rectangle picture (or square), or can they just be a bunch of random shapes? 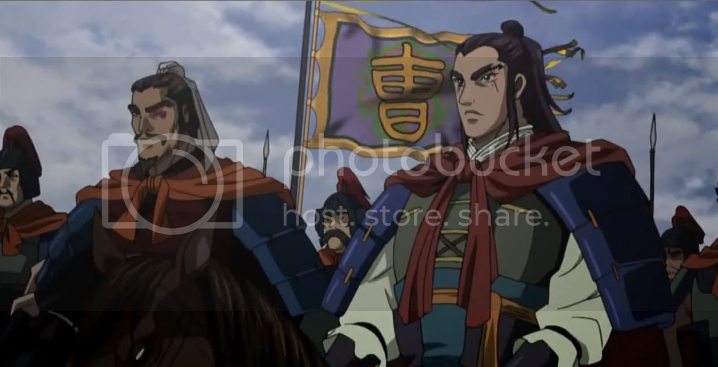 Added screenshots to Resurrection of the Dragon and a title picture for the RotK TV serial. Also changed the Koutetsu Sangokushi pictures and made them thumbnails. Finding pictures for the TV series is a little more challenging. 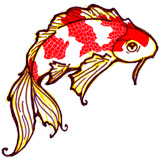 All of them are quite small (bordering around 300x300 pixels) so I'm not sure if I should include them or not. Don't know if there is an official poster for the Red Cliff movie. I've seen one with Sun Quan, but I'm not sure if that's the best picture we should use. I believe the official poster is the one with Tony Leung (Zhou Yu) and Takeshi Kaneshiro (Zhuge Liang) on it, and small pics of the other characters below them, cos' it's plastered all over the cinemas and the newspapers in my country. Alright, first off, I apologize for bumping a pretty old thread. I figured it would be better than making a new thread though. 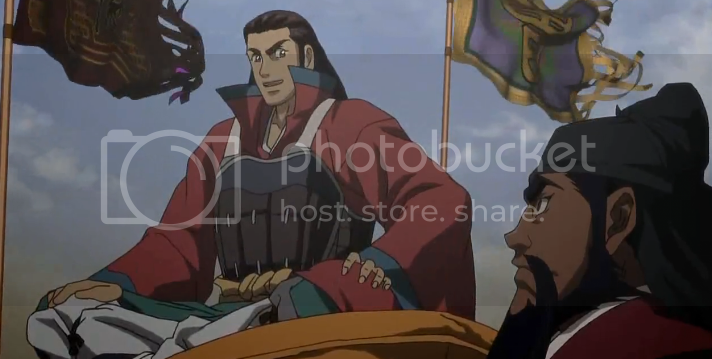 An addition to Three Kingdoms anime has come to my attention thanks to DrewTheDude: Souten Kouro. 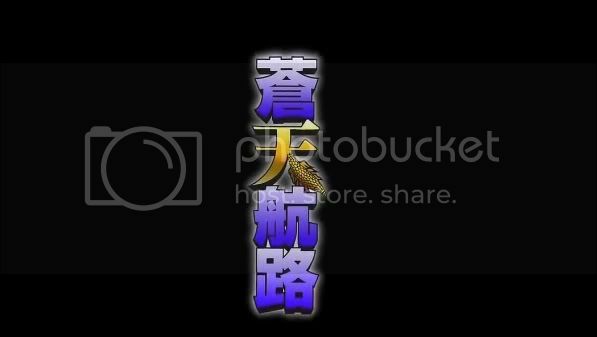 From what I can tell, in English the title is something equivalent to "Blue Heaven Will Fall" (in reference to the Han's destruction). 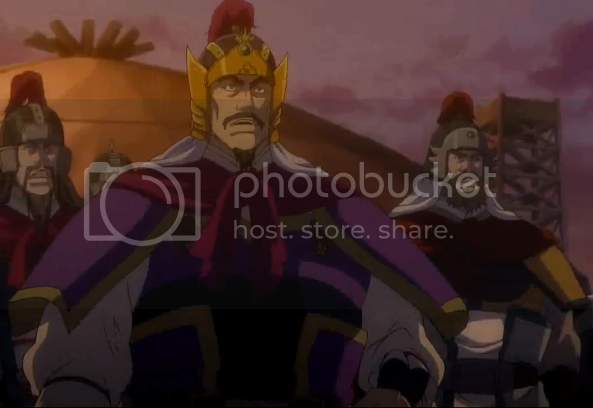 The anime focuses on Cao Cao, but Liu Bei, Sun Jian and other heroes make appearances. Naturally the anime takes many liberties with history, but what surprised me was the fact that the anime tries to get a lot of other things right. Some relatively obscure Late-Han characters are featured such as Chen Fan, Jian Shuo, Xu Rong and Zhang Mancheng. The anime makes some curious references to the Liang Rebellion and the Great Proscriptions as well. Generally speaking, the anime is slightly more realistic than something like Koutetsu Sangokushi (which focused on Lu Xun/Wu) or other three kingdoms based anime. Souten Kouru is also VERY entertaining. Cao Cao is a badass. Liu Bei is a charismatic, carefree and lovable guy. Yuan Shao is kind of an everyman (or everynoble perhaps?) who tries very hard but always finds himself two steps behind Cao Cao. 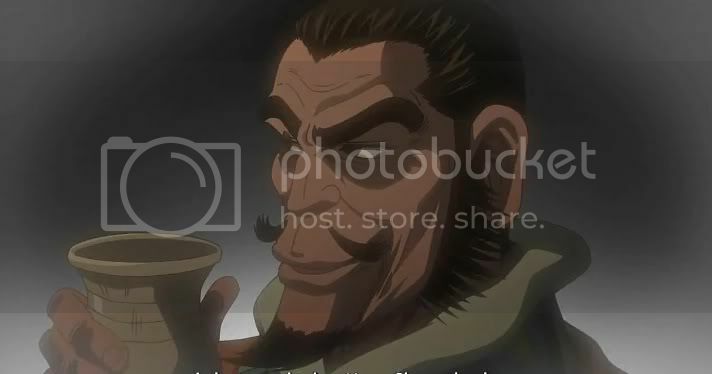 This anime also probably has one of the most sympathetic portrayals of Dong Zhou. He is shown as ruthless, but also cunning, calm and capable. 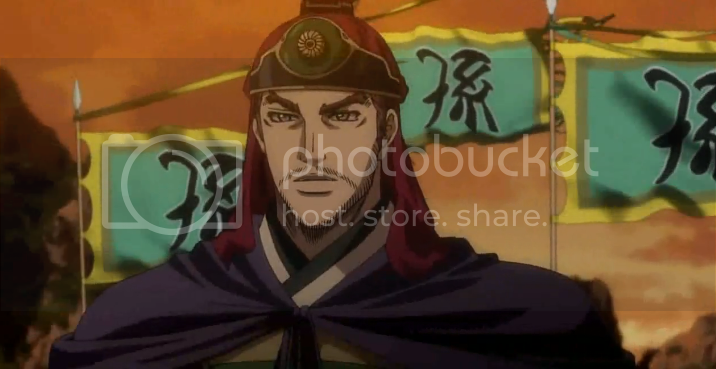 If anything, Dong Zhou's character closely resembles Cao Cao. The side characters are actually pretty interesting too. Yuan Shao and some subordinates. Yuan Shao is my favorite character thus far. Liu Bei and Guan Yu. Liu Bei is my second favorite character. Are you aware of any fansubs of the anime or fantrans of the manga...? I don't know about the manga at the moment, but I believe these guys are the ones who are subbing the anime. I saw some video on youtube that said they were going to do episode 13 soon. I gotta get on that new TV series too. It's definitely on my to-do-list. Looks fantastic.